Will Preisch and Joel Stocks have worked together through bad times and good. The worst was at the Bent Brick, which sought to showcase Preisch's wizardry with natural ingredients and modernist technique, but it was too much, too fast and flopped notoriously. After a healing hiatus, the two have charted a slow, steady ascent at Holdfast in its third, now-permanent location. 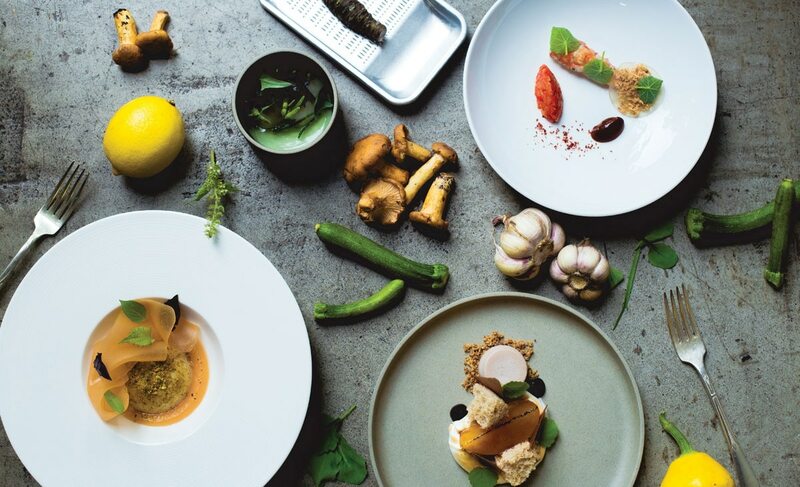 Holdfast 3.0 is an unqualified success, consistently offering thoughtful and delicious culinary compositions in a welcoming and intimate—but steadfastly utilitarian—space. Each meal is a set nine-course affair that includes alcoholic or nonalcoholic pairings and tip for $140. Diners occupy comfortable stools arrayed around a U-shaped counter or park at a lone table. But the bar is where you want to be, because behind it, Preisch and Stocks put the final touches on each dish, describe and then serve, remaining available to answer the inevitable questions. The co-chefs are ingredient obsessives and still head to the coast every other week on foraging missions. Each menu item is simply a list of key components, and most courses offer one or more of them in various forms. On a recent visit, "octopus, fennel, green olive" was an amazing-to-behold plate that included six variations on fennel—powder, frond, flower, pickled stem, diced bulb and jam; two takes on Castelvetrano olive; and baby octopus quick-seared as diners ogled in anticipation. Although dishes rotate frequently with the seasons, there are stalwarts on the menu: the sweet steamed brown bread (and butter) that arrives as a side dish midmeal and the oddly compelling savory-to-sweet transition course: a cornbread madeleine brushed with butter, topped with strips of lardo, a shower of Parmesan and a square of honeycomb. The tiny shell-shaped cakes have been served at every meal, which Preisch and Stocks have serially numbered. The count is approaching 700. Pro tip: Immediately next door to Holdfast is Deadshot, a bar Preisch and Stocks also mastermind. Think bar food and cocktails embellished with a little intellect, wit and whimsy.